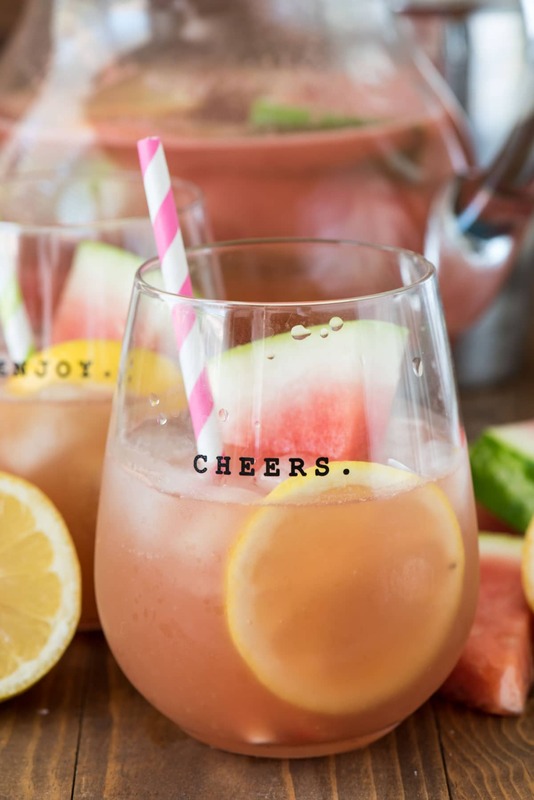 This Watermelon Lemonade Margarita is perfect for your summer BBQ or a Cinco de Mayo celebration! And the kids aren’t left out – they get a non-alcoholic version of Watermelon Lemonade! I have never been late to school pick-up, not once in almost 3 years. More, if you count preschool. Until last Monday. I had to run an errand before pick-up, and I left in plenty of time to make the round-trip. Until I hit every red light both directions and followed every single slow driver across my city, literally. By the time I got to the school, I had less than one minute until the bell. Of course, at this point there was no parking, so I ended up a block away. As I was getting out of my car, I heard the bell ring. Now, Jordan’s class always gets out late. Always. But, you know it’s Murphy’s Law: the one time I’m late I figured she’d end up out early and be standing there, crying, because I “forgot” her. And the other moms at pick-up would wonder what shopping line I got stuck in or if my computer ate me or something (not all of them, just the ones that think I play internet games all day and eat bon bons on my couch). I muttered an obscenity under my breath and did what any sane, rational person would do. I removed the thought-they-were-cute-at-the-time brown wedge sandals I was wearing and ran, barefoot, sprinter style all the way down the block, across the street while waving my arms to stop cross traffic, and over to the second grade classroom waiting area, where Jordan was nowhere in sight, still in her classroom. And there I was, panting and sweaty from my second workout, waiting when she came out. I dusted off my feet and put my shoes back on. I made it in time. I wasn’t late. No harm, no foul. Until we got home later that afternoon and I could barely walk. You know, from the sunburn the bottoms of my feet got from my barefoot sprint. 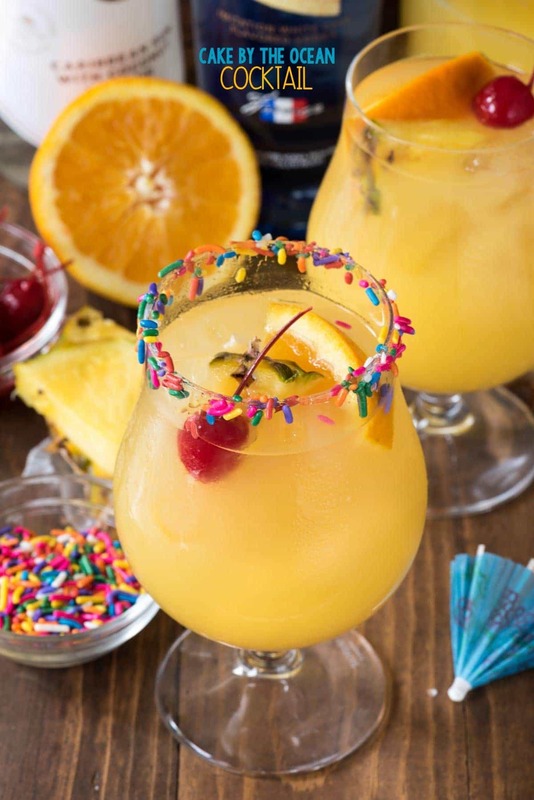 I don’t know about you, but all that calls for a Margarita. Yes? And because my kid wants one of everything I make, regardless if she’s allowed because it’s “for adults only”, I made her a kid-friendly (and non-drinker friendly) version. You start the recipe with a seedless watermelon. Please, I beg of you – buy a seedless one. The first time I made these I didn’t. Do you know how long it takes to de-seed a seeded watermelon? A long, looooong time. Cut up your watermelon and add it to a blender. Run the blender until it’s completely pureed. I double strain my puree with a mesh strainer to remove any pulp and make a pure juice. Or, at this point, if you want a frozen margarita, freeze the juice into cubes. In the warmer months, I almost always have lemonade on hand, either a carton, freshly made, or my old standby: Crystal Light. 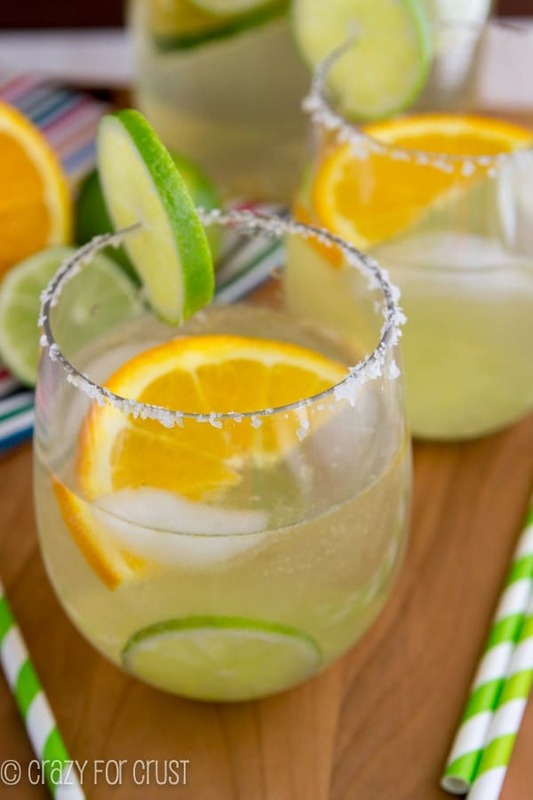 You can make these drinks with whatever lemonade you have or like. The margarita has the usual suspects: tequila and triple sec (orange liqueur). But it also has one of my absolute favorite liquors in it: midori. 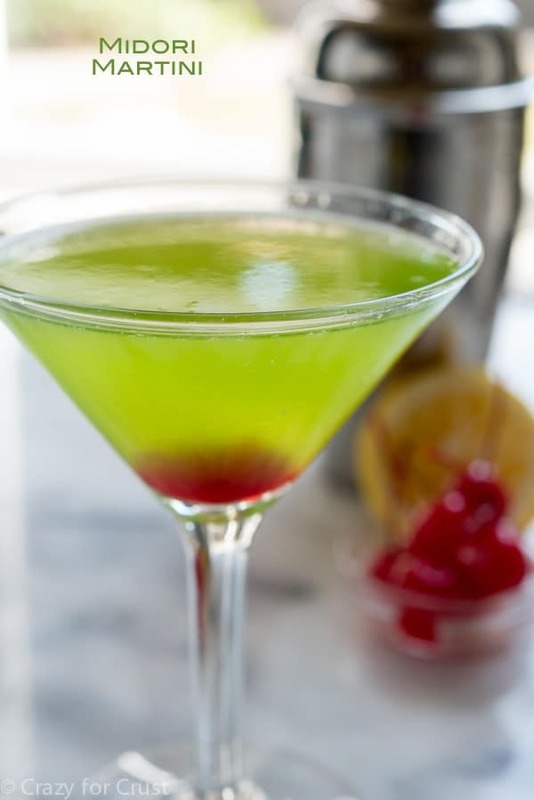 Midori is that green liquid in the liquor section – otherwise known as melon liqueur or melon schnapps. I love me a Midori Martini. Sometime I’ll make that for you. And tell you a really good story. When you mix lemonade, watermelon juice, and the liquor you get an amazing Watermelon Lemonade Margarita. These aren’t too strong (feel free to add more tequila if you like your drinks to punch you in the face) but they hit you all at once. Like, it tastes like juice and all of a sudden you realize…it’s not. And never fear – if you don’t drink or your kids beg you for a margarita when you drink one, I’ve got you covered. Leave out the alcohol and you will have your favorite lemonade yet. Seriously, it was SO good. Jordan couldn’t get enough of it! And after my school yard sprint, neither could I! This Watermelon Lemonade Margarita is the perfect cocktail recipe! Make one or a pitcher in just a few minutes, or make it non-alcoholic for the kids! Start with a half a medium-large seedless watermelon. Slice it, remove the rind. Puree the watermelon in a blender then strain it through a mesh strainer. (I strained it twice.) You'll be left with about 4 cups of watermelon juice, depending on the size of your melon. To make one serving: add all ingredients to a cocktail shaker filled with ice. Shake and pour over ice in glass. Garnish with watermelon and/or lemon slices. To make a pitcher: chill all ingredients. 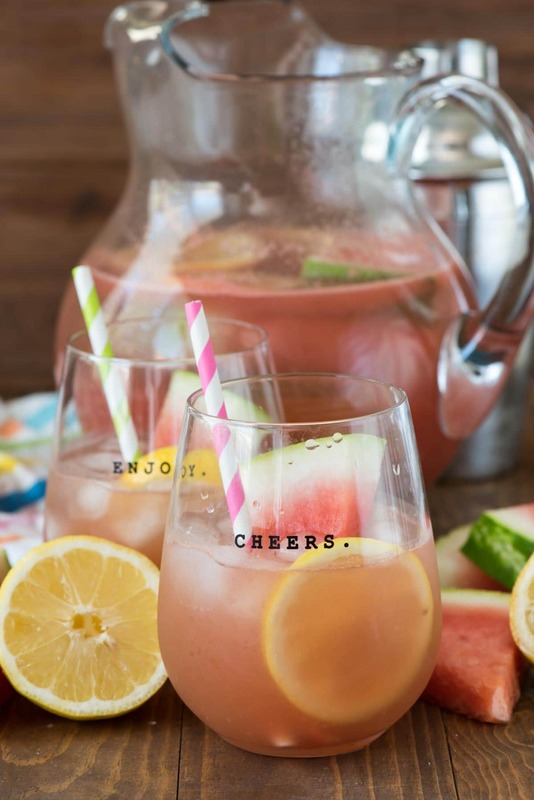 Stir all ingredients in a pitcher, garnish with watermelon and lemon slices. 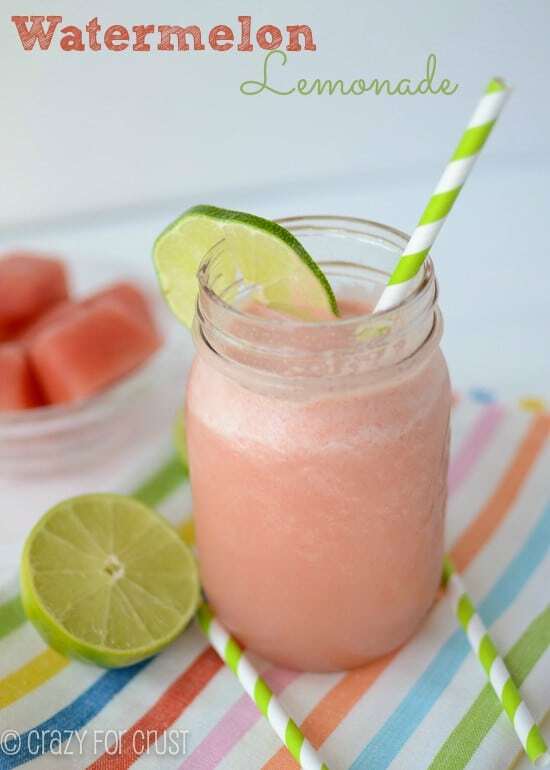 To make non-alcoholic: Stir cold watermelon juice with cold lemonade in a pitcher. Great for kids and adults! Want a frozen margarita? After step 1, pour the watermelon juice into ice cube trays and freeze. Make a cocktail with ingredients listed for one drink, but use 2/3 cup frozen watermelon cubes instead of the juice. I’m asking this out of genuine curiousity, so please help me out. If you’re going to cut the watermelon into cubes, blend them, then freeze them back into cubes, can you just freeze the initial watermelon pieces instead?